And thus, “The Beach” storyline (aka Close Encounters of the Nerd Kind) ends! Well, almost – I have a strange little epilogue for you all next week. Also, the questions that arose in this arc – How did cel know Musashi? What does she know about the aliens? Why did she leave? Will she and jefbot ever go steady and does she really like Zac Efron? – haven’t been forgotten and will be answered in future strips. Hope you all stick around as the story unfolds and thanks for all the feedback you guys have given me with your comments and emails. Keep ’em comin’! I love facial expresions in this, I liked what you were doing so far but lately I had a feeling, even with Cel in it, that it misses some cheerfullness. Its back and Im one happy reader. I kinda wanted to know what except Godfather does Jefbot have hanging on his walls, but you unfocused it… Oh, well. 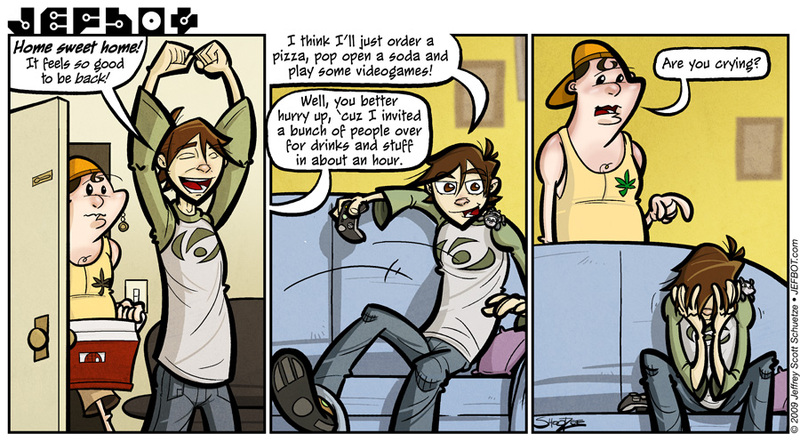 I jump on sofa exactly same way, though I dont have a game controler like that. I bet Jefbot used Force to summon it to his hand while he was flying… WHAT? You put in aliens in it! StarWars rulez. glad you’re happy with the boys back at the apartment, Maryz! Oh, turkeybot,oh turkeybot, in such elusive manner. Just whack ’em with a spanner. Boy, Cornfather’s liver knows no bounds! the Cornfather – and his counterpart in real life, Michael – has miraculous powers of recovery when it comes to alcohol, Stan! it’s truly amazing. i’m with ya there, ESQ – i get burned out on being social real quick. unfortunately, my roommate truly is a social butterfly pterosaur. Oh no! …so true. I just hope that he remembered to invite Cel! I have a feeling you’re never going to get peace and quiet… P. S. I LOVE the first frame! Open mouthed, eyes closed great expression! the fact that this story has taken as long as it has to tell gives this conclusion added weight. not complaining about that, understand, i’m saying well done on knowing the perfect way to cap this one off. and i will keep coming back to see these questions answered, you can be sure. I always love seeing jefbot crying…. I feel like your strip didn’t fall back…? ugh. i actually need more hours in the day to get these strips done, not less, sis! I know JUST how you feel, jefbot. You think you’re safe at home and then someone has to be social. Yuck. But I sure wouldn’t mind if cel came over. no one’s safe in my apartment, Annie. no one! Something awesome needs to happen for both BOT and the Cornfather, ’cause the bromance levels are at an all time low! They need 600 ccs of bromine, stat! i’m feeling that the bromine levels are low, too – bot and the Cornfather definitely need to get their groove back. If I didn’t know better I’d say the CF almost looks like he feels sorry for jefbot. Almost. CF’s not sorry enough to cancel the party. I’m hoping Cel calls and invites JB away from all that. I really want to see more of Cel! Just when he thinks he’s won, the sun burnt cornfather just brings out that cat-o-nine-tails and whips him back into tears. at least jefbot has the satisfaction of knowing the Cornfather’s gonna be in a world of hurt once that sunburn kicks in, ZL! Poor Jefbot! Can’t a misanthropic shut in get some peace?!??! seriously! and while we’re on the subject of peace and quiet – help me get those noisy kids off my lawn, JK! you and Xinda coordinating your comments, MC? thanks, dude. yes, being a pro partier takes *way* more dedication (and time!) than i have, actually. i’ll just live vicariously through you. I get exactly that feeling when I’m chatting with my boyfriend online and my mom pops her head in the room to declare that I need to take the dogs out before I go to bed, as though I wasn’t already quite aware of the fact. Why yes, mother, I do know I can’t afford to live alone right now. STOP RUBBING IT IN! I love the shadow work on this strip, it’s utterly beautiful. Unfortunately, the others are right: Jefbot’s walls seem to be adorned with some oddly geometric beige stains. you watch, those “oddly geometric beige stains” are gonna be all the rage in people’s homes a decade from now. The stains may be all the rage, but they will never be in my house. Thanks for this storyline, Jeff. It’s fun too see things go off the beaten path on occasion. AAAAAAAAAAAWWWW pooor jb, but cf is awesome for beeing able to party that much XD. the Cornfather does have some amazing powers to party, nicodemus. nope. hopefully things will turn out better for him next strip, Sonitan. Just found this comic and read the archive, it’s excellent! Heyyyy! we can reply to each other posts now? Cool! I know you wanted to incloode this on your pages for a while, congrats and thanks! happy you approve, Maryz! yeah, i held off for a while but finally relented and installed it over the weekend. thanks for giving me an opportunity to give this thing a whirl! heheh. seems to be working. thanks, Purplefood! glad you’re liking the story – the epilogue of which is coming up tomorrow, so come back and check that out (it’s a special, BIG strip!). I love how jefbot’s relaxed and carefree, then gets the whammy.